This corset was dreamed up to evoke to feelings of a 50's style mental asylum. Constructed from a cotton twill exterior and vegan leather belts with a cotton twill liner, this corset is perfect for Steampunks and Goths alike. This corset uses faux leather belts and a white twill, tied together with white satin laces nickel hardware, and best of all, real coutil! This corset was dreamed up to evoke to feelings of a 50’s style mental asylum. 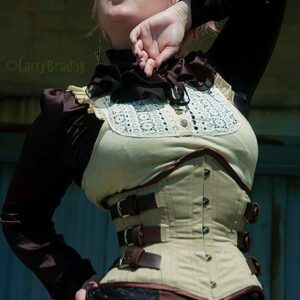 Constructed from a cotton twill exterior and vegan leather belts with a cotton twill liner, this corset is perfect for Steampunks and Goths alike. This corset uses faux leather belts and a white twill, tied together with white satin laces nickel hardware, and best of all, real coutil!